Challenges - Experientials - Recruitment, Oh My! Visit the Skills21 YouTube channel to view all Expo Fest Challenges for 2017! Videos will also be posted on expofest.skills21.org this week! Thank you for your responses to the Community of Practice scheduled for Wednesday, November 2nd at Avon Old Farms Hotel. Unfortunately, the majority of you are unable to attend therefore we will have to cancel the Nov 2nd Community of Practice. Again, we appreciate the responses and hope to be able to provide support as needed. Please do not hesitate to touch base with any Skills21 program manager or staff listed with questions or concerns at this point in the year. We are taking another big step! Skills21 is once again changing email addresses in hopes to keep contacting us as simple as possible. 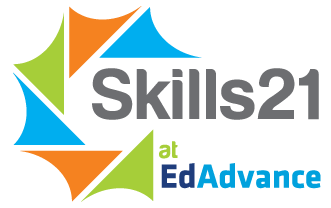 Please note we are moving from the, still new, @edadvance.org domain to our very own @skills21.org domain. All emails will forward to @skills21.org but we do want to give you that heads up! The Level 1 Skills21 STEM Academy had a great kickoff research event at Mystic Aquarium last week. Congratulations to Pomperaug Group B for taking first place in the STEMarine Team Challenge. All teams handed in great work using resources available. Digital Media Summit is happening this week! We will see a number of you and your students on Friday at Uconn Stamford. We are looking forward to a day focused on New Media, Films, and Branding. Keep an eye out for a finalized agenda in the next few days. Skills21 will be spending two days on campus at Quinnipiac University in December. Be sure to check in with your school site coordinator or Skills21 Program Manager for more information. Student Rosters must be shared with Sarah by November 15th. Skills21 would like to provide support for recruiting and retention for Skills21 challenge-based programs. To better gauge what would best serve your school we have created a brief survey. The Skills21 team asks you to complete the survey below and provide any and all information that may help engage your student population.